When it comes to whitetails, hunters are shooting nearly as many, if not more, bucks than does these days. It’s that most magical time of year for whitetail deer hunters. The rut is at its peak or very close to it. Bucks — including those mature, thick-beamed, heavy-bodied and typically hard-to-kill ones worthy of magazine covers — are focused on breeding to the exclusion of everything else. They’re as vulnerable as they’re ever going to be. Serious hunters know it – oh boy, do they – and they’re feverishly seeking them right now. That’s no different than how things have long been. There is, though, seemingly one change going on in the deer woods. And it has to do with antlers. According to statistics compiled by the Quality Deer Management Association, hunters – across the totality of the whitetail range, taking in 37 states and six Canadian provinces – killed almost as many antlered deer as antlerless ones in 2016. And they likely killed more in 2017. That’s not official yet. Harvest totals from last year are still coming in, said Kip Adams, director of conservation for the Association. But he said there’s “a good chance” the antlered kill overtook the antlerless kill – which includes male fawns — last year. That hasn’t happened in 20 years. The last time was 1998. Adams isn’t excited to see it now. He said it’s generally bad for deer and deer hunters. Hunters typically have to shoot more does than bucks to control deer populations and keep them in balance with the available habitat, he said. That’s because of deer lifestyles. Whitetail fawns are born at about a one-to-one ratio of males to females. Deer managers maintain that as closely as possible, Adams said. But that requires focusing hunter attention on does. “Because bucks are like us. It costs more for guys to have life insurance and vehicle insurance because we’re more likely to do something stupid and hurt ourselves or kill ourselves. It’s the same for bucks,” Adams said. States in the far north – Maine, Vermont and New Hampshire, for example – regularly see hard winters. The result, Adams said, is fewer fawns born each spring and fewer surviving the following seasons. Meaning, nature claims enough deer each year that hunters don’t have to do the work of balancing herds, Adams said. That’s not the case in most places, though, he added. Generally, it’s up to hunters to take more does than bucks. But antlerless harvests are trending downward. According to the Deer Management Association, 19 of 37 states, or 51 percent, shot fewer antlerless deer in 2016 than they had in 2015. And 31 of 37, or 84 percent, shot fewer antlerless deer in 2016 than their previous five-year average. There appear to be several reasons for that. A lot of states saw their deer populations grow until, in the late 1990s and early 2000s, “they had more deer than they knew what to do with,” said Gabe Jenkins, deer and elk program coordinator for the Kentucky Department of Fish and Wildlife Resources. So they ramped up antlerless hunting opportunities to bring deer numbers down. They offered more licenses, lengthened seasons and increased the number of deer hunters could kill in a given year. “And I guess the takeaway from that would be, mission accomplished in a lot of states,” Jenkins said. They reduced populations to the point that antlerless harvests need not be as high as they once were, he said. Antlerless harvest totals reflect the goals of each time, he said. Predation appears to be another factor. In Pennsylvania, where he lives, and across the Northeast, coyotes have been preying on deer for decades, Adams said. And whitetails adapted. But in parts of the Southeast, he said, coyotes are a much newer part of the ecosystem. And they’re holding deer populations in check or even reducing them. Disease is also increasingly shaping today’s whitetail world. Chronic wasting disease – an always fatal ailment that effects deer, elk and other cervids – is spreading across the nation. That has long-term implications, Jenkins said. Still more widespread and more impactful in the short term, he said, has been epizootic hemorrhagic disease. Caused by a mite, it seasonally kills deer, sometimes in large numbers. Once confined to the deep South, it now occurs throughout the whitetail range, with deadly outbreaks seen in 2007, 2012, 2014 and – on a lesser scale – this year. Wildlife managers inclined to let hunters shoot more deer in the past are hesitant now, Jenkins said, worried that cyclical outbreaks of disease will ultimately prove a double whammy. “It’s unfortunate. But it’s something we’ve got to think about in how we manage,” Jenkins said. Hunter effectiveness and even cooperation – tied to access and tradition – are other limiting factors. There are places in Minnesota, Norton said, where biologists would like hunters to kill more antlerless deer. They’re allowed seven or eight a season. “But very, very, very few are harvesting anywhere close to that,” he admitted. Norton said that’s often because they can’t get on the private property where the deer are. In other places, it’s not access but attitude that holds antlerless harvests down. Michigan hunters shoot tens of thousands more antlered deer than antlerless each year. That doesn’t necessarily have to be the case, Adams said. The state’s Department of Natural Resources wants to increase the doe harvest. Hunters just aren’t helping, in part because of dated thinking that says shooting any doe is a bad thing, Adams said. He pointed out that Michigan offered more than 70,000 antlerless tags in one five-county area last year. Hunters bought only half or so, and actually killed only about 12,000 deer. “It’s not like, well, yeah, they’re getting close to what the DNR wants. They aren’t even in the same ballpark,” he said. There is no “magic number” as to how many antlerless deer each state should harvest, or what percentage of their overall take it should be, Adams said. “It varies depending on where you are,” he noted. And truth be told, some states have no quantitative deer management goals. In Tennessee, for example, hunters in much of the state can shoot five antlered deer a year and three antlerless deer a day – a day – for almost four months. Whether that’s appropriate is not entirely clear. 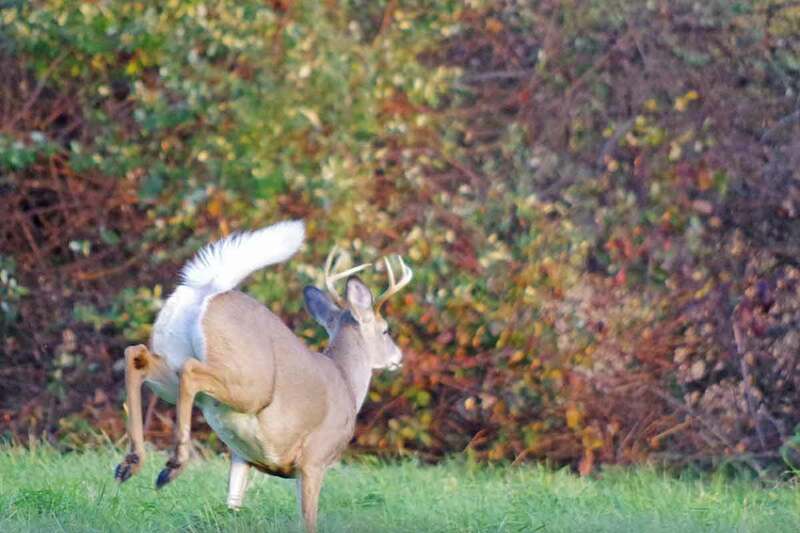 “We’ve never set explicit objectives on what we want the population to be, more, less or the same, which obviously would have implications for the harvest,” said James Kelly, deer management program leader for the Tennessee Wildlife Resources Agency. That’s hopefully coming, he said. The agency is looking at re-drawing the boundaries of its various management units, then setting population and harvest goals for each. If and when that happens, the antlerless harvest could conceivably change, one way or the other, Kelly said. Other states are in similar situations. Adams just hopes that the old days of hunters being unable or unwilling to shoot antlerless deer, to the detriment of the habitat, don’t come back. “It’s been a while since it happened. And hopefully it’s a while longer,” Adams said.